Manufacturer of tartaric acid enantiomers and their salts and esters. Located in China. Fine chemical manufacturer in China, producing pharmaceutical ingredients, hindered amine light stabilizers, and intermediates for the pharmaceutical and dye industries. Manufacturer in Henan, China, of flotation chemicals, rubber additives, fine-chemical intermediates, and feed additives. Fine chemical producer in China, offering its own range of chemicals as well as custom synthesis services, specializing in hydrogenation and synthesis of organic halides and heterocyclics. Manufacturer of fatty amines, surfactants, and fine chemicals. Produces agrochemicals, fine chemicals, and pharmaceutical intermediates. Supply chain specialists of mission critical fine and specialty chemicals for manufacturers. Distribution facilities are located both in the US and Canada. Includes company profile, and product information sorted by industry applications. Manufacturer of butyrolactone and pyrrolidone derivatives in China. Products are used as solvents and as chemical intermediates. offers pharmaceutical intermediates and fine chemicals including hydrochlorides of 2-chloroethylamine and amino acetonitrile. Manufacturer of fine chemicals including tribromoneopentyl alcohol, dibromoneopentyl glycol, and tris-2-hydroxyethyl isocyanurate. Manufacturer of potassium carbonate and a range of organic fine chemicals including phenylhydrazine, sulfonated aromatics, and cresidine. Manufacturer of fine chemicals in China, whose products include pharmaceutical and dye intermediates, dyes, photo-initiators, and hexafluorophosphates. Manufacturer of aromatic intermediates for hair dyes, photographic chemicals, pharmaceuticals and agrochemicals. Located in China. China. Manufacturers of water and solvent based disperse, acid, vat and direct dyes, and fine chemicals for the textile industry. Industry guide with listing of chemical manufacturers, exporters and importers. Buy and sell trade offers for organic chemicals, inorganic chemicals, fertilizers, dyes and related chemical products. Produces fine chemicals including pesticide intermediates and pharmaceutical intermediates. Diversified manufacturers of specialty and fine chemicals, and of chemical and auxiliaries for the construction and leather processing industries. Detailed technical information and specifications. Producer of fine chemicals such as p-chlorophend, 2,6-dichlorophend, 2,4,6-trichloropend, o-chlorophend, and dilospam triclosan, etc. Engaged in manufacturing yellow phosphorus, phosphoric acid and fine phosphate chemicals. If the business hours of Wenzhou Longwan Tartaric Acid Factory in may vary on holidays like Valentine’s Day, Washington’s Birthday, St. Patrick’s Day, Easter, Easter eve and Mother’s day. We display standard opening hours and price ranges in our profile site. We recommend to check out chinatartaric-acid.com for further information. 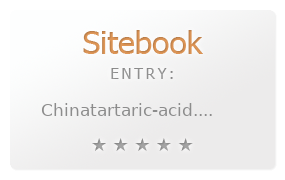 You can also search for Alternatives for chinatartaric-acid.com on our Review Site Sitebook.org All trademarks are the property of their respective owners. If we should delete this entry, please send us a short E-Mail.